I don't want to make too much of the making of and sitting by campfires mainly because it is something that most people who go camping have probably experienced for themselves,and that sitting by a good camp fire is vastly superior to watching TV. Still, it is something that needs to be said. And I have some theories about why a campfire is better than TV and I will share them with you. Feel free to disagree. First of all, the obvious - fire is entertaining in and of itself. There is drama in a fire. One knows the plot well enough but never the details. Wood, at first reluctant to burn for a variety of reasons like wind, lack of kindling, moisture, etc. eventually is made to burn. Then the fire burns, produces coals and maintenance of the fire becomes easy, one simply throws more wood on the fire and at some point becomes tired of the process and lets the fire die for lack of fuel or actively snuffs it out. This is the plot of the entertainment known as fire. And there are many variations on it. The primary reason I prefer fire over TV is that fire has no political or social agenda. It does what it does. It burns according to various basic rules and thus is educational about the laws of thermodynamics. Not that looking at fires is what inspired thermodynamicists to come up with their theories, but looking at fires does give one a sense of how fire works and that in itself may give rise to many useful metaphors. TV on the other hand is almost entirely agenda driven. Someone is selling you something constantly, obviously through commercials but also in the content that the commercials enable. Implicit in all story telling is a viewpoint, a lesson, a moral. Even if nothing obviously new is being communicated, the very fact that the TV portrays some activity is some kind of endorsement for it or a polemic against it. If you don't agree with the lifestyle choices of the people portrayed on TV then TV watching is a chore. So fire, much better. Finally, sitting by a fire with other people is a social affair and as such, becomes a lab experiment in social dynamics. For one thing, the progress of the fire needs to be managed and as someone once famously said, no two people can ever agree on the right way to poke a fire. If more than one person wants to manage the fire, a struggle invariably ensues, covertly or overtly. Words will be said about the management of the fire and a winner in the struggle will emerge. Enough for now, I have found that the internet has lots of campfire pictures. 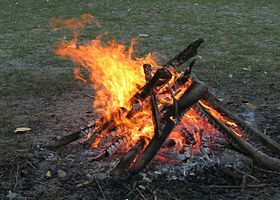 I will comment on some of them in future posts since the pictures raise specific points such as preferred ways to arrange the logs, what to wear to a campfire, safety issues around the campfire, what to talk about at a campfire, how to cook on a campfire and more. I couldn't agree more. I spent 6 months doing fisheries work and living out of a tent. We had a fire almost every night and never got bored. Not to mention, it was one of my most productive summers, which I have attributed to the lack of TV. I learned how to play some instruments, read more books than I ever have, and enjoyed the company of my coworkers around the fire. Plus, nothing was as nice as the crackle and smell of fire after a cold day working on the river. The fire warmed us, entertained us, cooked for us, and served as the hub of socialization (if you could call it that. There were only 8 of us and we were out in the middle of nowhere). Plus, even after the fire dies, it is still useful. One of my favorite uses for the coals is smoking fish (http://imakemybeer.blogspot.com/2011/12/smoking-fishthe-old-way.html). You start with an entertaining hardwood fire, and end with delicious food.